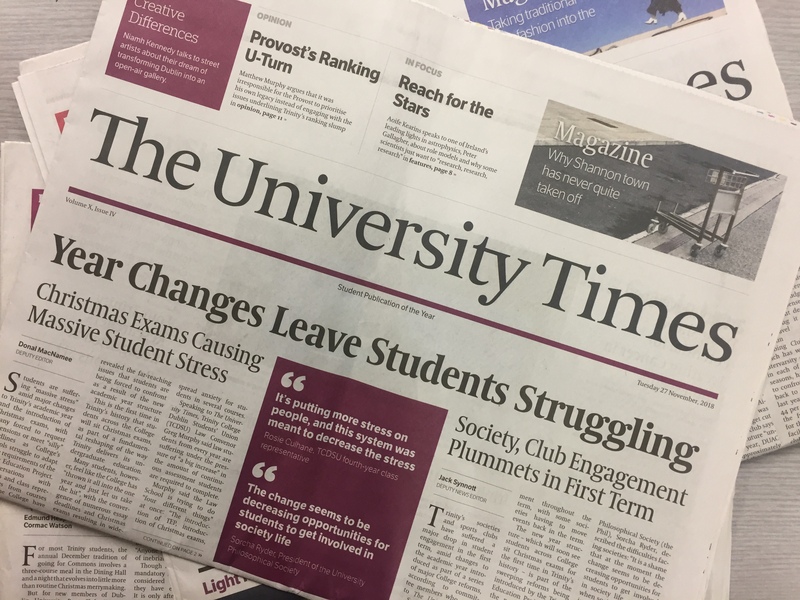 Trinity students have voted in a referendum to reject cutting the budget of the University Times. The proposal was rejected by by a margin of 74% to 26%. 3089 students voted in the referendum with 2271 voting to reject the proposal and 788 voting to support it with 30 spoiled ballots. The referendum was triggered by a petition, signed by over 500 students calling for the budget of the paper to be cut in response to a controversial article on alleged hazing by the Knights of the Campanile. The article involved placing a recording device outside the private residence of Ben Arrowsmith, the president of the Knights. The proposal, which would have come into effect from the start of the 2020/2021 academic year would have meant UT’s budget being cut from €45,000 per year to €3,000 per year. Funding for the paper is provided by Trinity College Dublin Students’ Union (TCDSU) and is guaranteed by the union’s constitution. The constitution currently requires that the union make “provision of a salary for the editor only, granted on a monthly basis during term”. Similar to the other members of the union’s sabbatical team, the UT Editor also receives on-campus accommodation. The proposal put forward in the referendum would have amended TCDSU’s constitution to state: “The petition proposes an amendment to the constitution to state: “The Union shall not support the publication of the University Times in the following ways: (i) Provision of accommodation on campus during teaching term. (ii) Provision of a salary to any member of the staff of the University Times.” The proposal further suggests that the UT Editor submit and present a written report at each TCDSU Council. The proposal would the provision of an office and facilities for the newspaper, but sought to remove the existing stipulation that an issue of the newspaper be printed at least once a month during each teaching term. It stated that the union should provide “no more than €3,000 to the publication of the newspaper annually”. The controversy over the Knights of the Campanile article attracted the attention of national press and saw commentary made by professors of Trinity’s Law School as well as the Provost Patrick Prendergast. The No campaign was led by Kathleen McNamee, Assistant Editor of the paper.